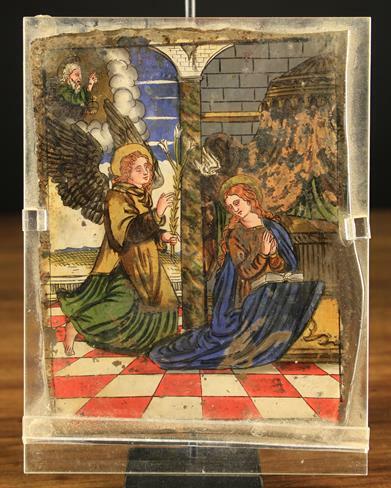 A Reverse Painting on Glass, Swiss, 16th Century. Depiction of 'The Annunciation'. Set in a display stand, 7 in x 5½ in (18 cm x 14 cm). 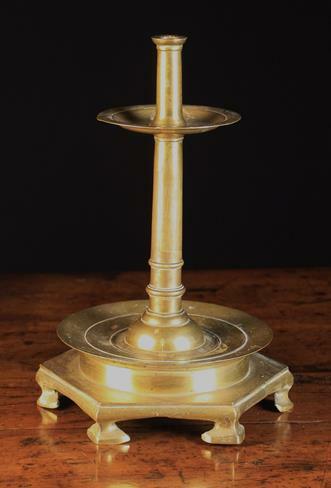 A 16th Century Style Flanders Brass Candlestick. 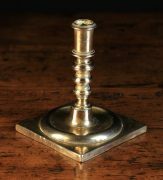 The socket with a rectangular openings above a slender fillet knopped stem and stepped dome base with integral drip-pan, 10 in (15.5 cm) in height. A Large, Unusual Taper stick, possibly 16th Century [strong similarities to an English example discussed & illustrated in 'English Candlesticks before 1600' by W.G. Mackay Thomas, page 120, late 55]. 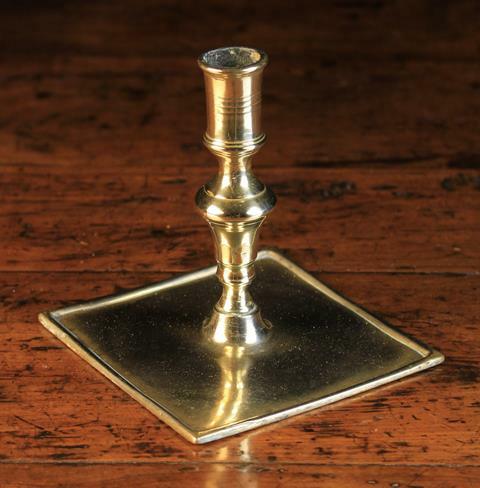 The socket above an upper drip tray and columnar stem with lower drip tray to the hexagonal base standing on roughly cut-away feet. 13 in (33 cm) in height. (Ex Paul Tomasso). 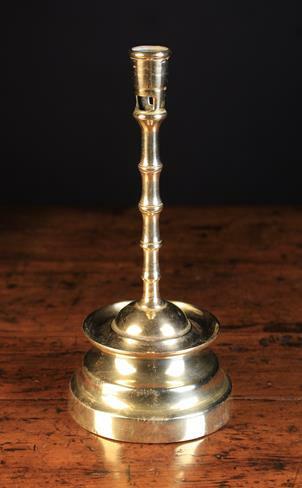 A 17th Century Franco-Dutch Candlestick. 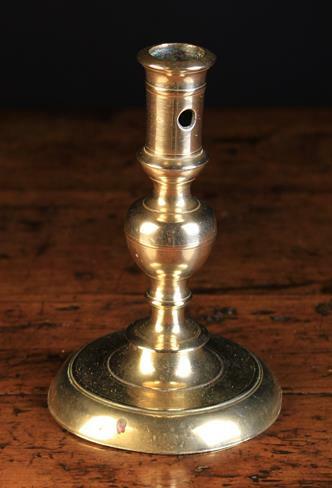 The cylindrical socket pierced with wax ejector hole above an octagonal tapering stem and octagonal base with round dished centre, 6¼ in (16 cm) in height. 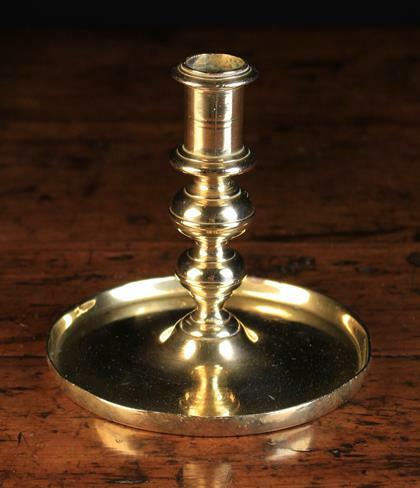 A 17th Century Candlestick, Circa 1680, Low Countries. The deep cylindrical flanged socket with a pierced round aperture, on a bulbous stem and raised circular foot with ring turning, 7 in (18 cm) in height. [A very similar example is illustrated in 'Making Fire & Light in the home pre-1820' by John Caspall, page 99]. 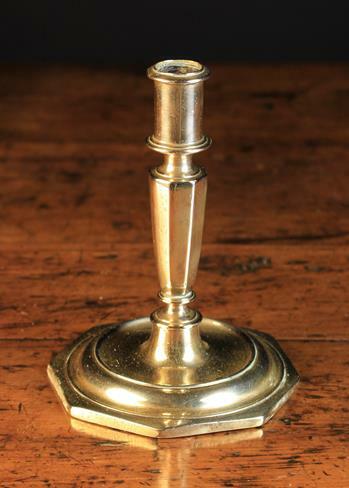 A 17th Century Spanish Candlestick. The cylindrical socket above two ridged compressed ball knops of graduated size, and peened to a circular tray base, 5¼ in (13.5 cm) in height. A Late 17th Century Candlestick with knopped stem peened to an octagonal base with circular dished centre, 6 in (15 cm) in height. 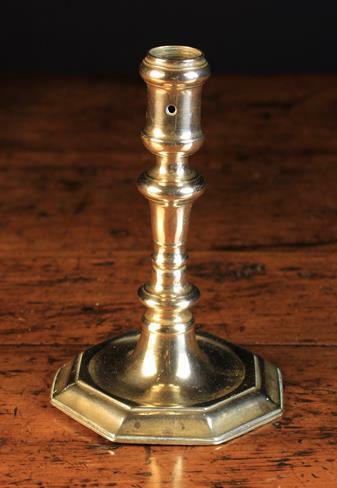 A Spanish 17th Century Candlestick. 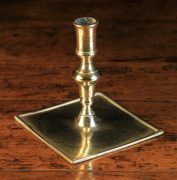 The turned socket on integrated knopped stem peened to a flat square tray base, 5 in (13 cm). 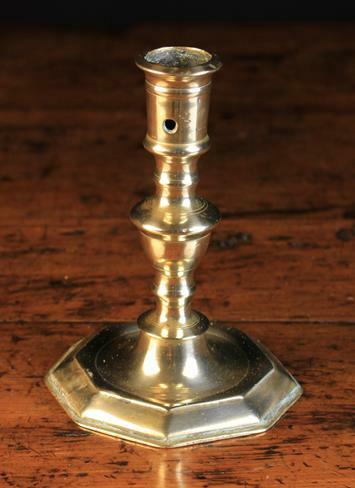 A 17th Century Spanish Candlestick. 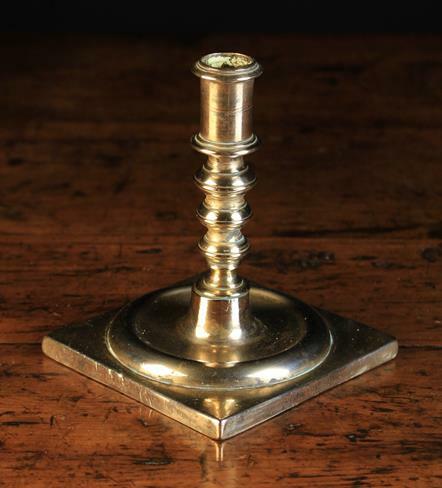 The cylindrical socket above a stem of three graduated flattened & ridged ball knops, peened to a square base with raised circular dished centre, 5½ in (14 cm) high.